Can be used with other makes of quality grease guns with a standard grease coupler. 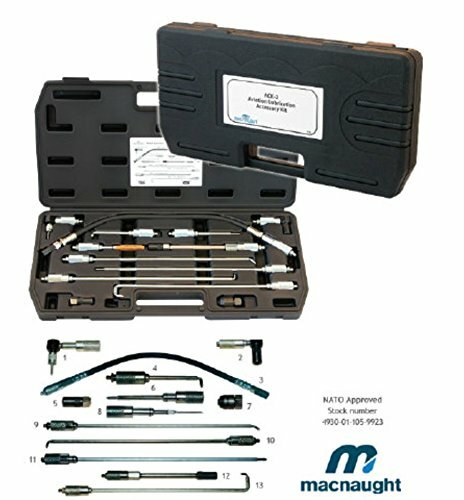 Use of the ACK-2 kit ensures positive, professional class greasing of small to large aircraft both civil and military. Provides accessories specially designed for greasing extremely difficult access areas such as flap-tracks, ailerons, landing gear and other hard to reach locations. All kit items have been fully tested and approved. All kit pieces are available individually for replacement or specific applications. If you have any questions about this product by Macnaught, contact us by completing and submitting the form below. If you are looking for a specif part number, please include it with your message.